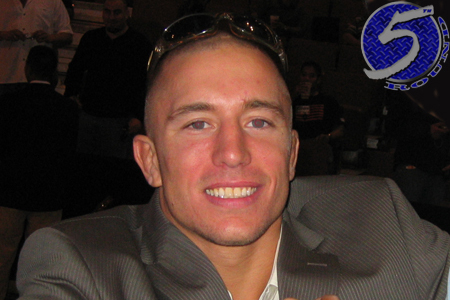 On Thursday afternoon, UFC president Dana White said the promotion has tentatively arranged for reigning welterweight king Georges St-Pierre (pictured) to make his next title defense against Johny Hendricks in November. Either Mandalay Bay Events Center or the larger MGM Grand Garden Arena in Las Vegas, Nevada will host the shootout. The event will likely be dubbed UFC 167. Hendricks earned next dibs at St-Pierre’s throne by posting a unanimous decision victory over Carlos Condit at UFC 158, the same March night that GSP dominated Nick Diaz to retain his hardware. White previously dubbed Hendricks the division’s #1 contender after he put Martin Kampmann to sleep at UFC 154, only to change course shortly after when St-Pierre demanded a fight against bitter rival Diaz. “Bigg Rigg” has been putting St-Pierre on blast for months. He even claims GSP is “scared” and has been “ducking” him. Be careful what you wish for, Johny. St-Pierre has collected 11 consecutive lopsided wins, with his last eight coming in title defenses. However, Hendricks’ solid wrestling base parlayed with his one-punch KO power has many pundits believing he will dethrone St-Pierre. Nonetheless, this is “Rush’s” toughest test to date.